La Madeleine Bakery & Café gives you a taste of that indulgent, laid-back, community-based and joyful Parisian lifestyle. La Madeleine is directly adjacent to the Mall of Georgia, where you can grab a quick cup of coffee and a pastry to relax after your holiday shopping spree. Nowhere in the world is there as strong of a relationship between food and daily life as in France, and La Madeleine’s goal is to give you a taste of that indulgent, laid-back, community-based and joyful Parisian lifestyle. While La Madeleine offers to-go orders for those in a hurry, the restaurant is designed in a way that encourages guests to comfortably gather around the fireplace, hang out, share food and enjoy the simple pleasures of a meal and conversation together. La Madeleine prides itself on using wholesome, fresh, seasonal ingredients and hand-crafted recipes originated from The Loire Valley in France – a place known as “the garden of France” and where the style of cooking is “le bon et le bien” – good and healthy. “Everything is baked and prepared fresh in-house,” said Kyle Hakim, Vice President ofOperations. “Our pastry chef, Lisbet Vivas, trained in France and baking is her passion. Pastry-making truly is an art and our pastries are what set us apart from the competition,” he continued. Hakim’s family has been in the restaurant industry for over 30 years and when the opportunity to own and operate La Madeleine locations in Georgia and North Carolina, they knew it was meant to be. “When I was growing up in Texas my dad used to work on the weekends and it was tradition for my mom to take us to La Madeleine every Saturday. I always got the Chicken Friand (balsamic chicken and swiss, mushroom filling in a puff pastry topped with wild mushroom sauce) and that is still one of my favorite dishes here today,” Hakim said. In another nod to destiny, Hakim’s father ate at La Madeleine on opening day of its first location in the 1980s on the SMU college campus in Dallas, Texas. His parents were both French-speaking immigrants from Lebanon, a Middle Eastern country heavily influenced by French culture because of France’s colonial rule over the country prior to WWI. 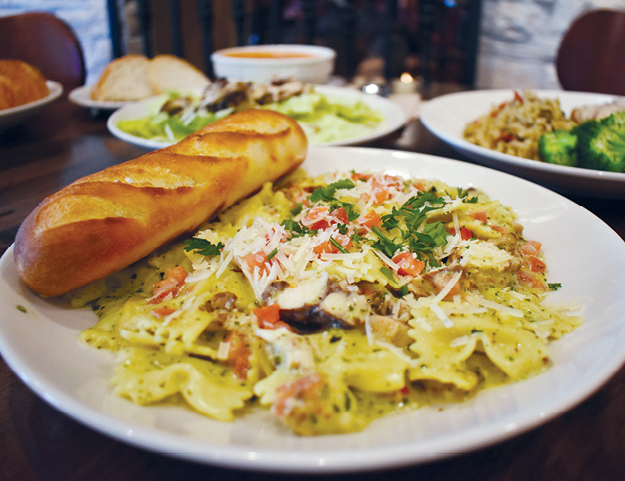 “We speak the language and understand the culture so this (La Madeleine) was a good fit for our family,” Hakim said. Handcrafted, signature croissants, delicious cakes, beautiful tarts and pastries that are made in-house line the display case. La Madeleine was founded in 1983 by Frenchman, Patrick Leon Esquerré, who had a dream to bring a real, country French bakery (boulangerie) to the Southeast United States. With the help of his mother, who flew overnight from France with her recipes in tow, his dream came true and now La Madeleine has over 70 locations across the U.S. that still maintain the integrity of his mother’s original recipes and new offerings that are inspired by the ongoing food trends of authentic, French cuisine. While the menu has long-standing staples such as Quiche Lorraine, Croque Monsieur, Tomato Basil Soupe and savory Crepes and homemade jam, the menu rotates three times a year based on seasonal ingredients.